Welcome to Babblings of Bonny Brookes. Have you ever had the opportunity to have your name on the cover of a book or get a pre-publication edition of a book? Here’s your chance! This story takes the reader back in time to mid-20th century as they follow a girl’s life, moving from farm to city, and experience her loves, losses and even the violence she encounters from those she loves the most. Interested? Only the first 50 people who response with their name and email address will be included on the “invited only” reader list. Do it now and you may have the opportunity to read the story, chapter by chapter, as it is being written. And, should you be willing to write a review once you’ve read the entire book, your review may wind up on the back cover! To get you started, below is the Prelude (1st chapter) to The Yellow House by Bonny Brookes. My eyes opened to blackness. Where was I? Reaching out I felt the stiffness of the dry hay under my hands. I rolled my head to the side, causing it to throb. Looking up, I watched faint rays of sunlight slowly appear, cascading through an opening. The top half of the stall door was swung open allowing this light to illuminate the area I found myself in, lying flat on my back. And then, I remembered. Bolt, my beloved black horse of the past fifteen years who had a white stripe running down her side in the shape of a lighting bolt, had been frightened and kicked up her front legs. In doing so, she grazed me in the process and sent me backwards. Yet she was not in the stall now. Where was she? What had startled her? I rolled over, reached up and grasped the ledge on the bottom half of the stall door to heave myself up, while fighting the dizziness that threatened to send me back to the ground. Once erect, I placed my hand on my forehead, in an attempt to stop the throbbing. Soon the reeling slowed and I looked around. Sunlight filtered through the barn’s open door and I could easily see Bolt was not inside. Tentatively, I pushed open the unlatched stall door and with each step, gained strength making my way to the barn’s exit. As I got closer to the door, I heard loud, angry male voices. Suddenly, a deafening boom ripped through the air followed by complete silence. I raced outside, yet temporarily blinded by the full sunlight, I didn’t see the large object in front of me and landed with a thud on top of something. I placed my hands underneath me to push myself up and felt a soft and familiar body. I looked down to see my beloved Bolt. Dead. Lifting my head, I saw my father ten feet away holding a smoking rifle in his hands. Next to him stood a man I despised. On his face he wore a sinister grin. Interested? Then please send your email address and name now and I’ll let you know if you made the top 50 list! Also, if you know of someone else who may be interested, feel free to forward this message on! I reached over touching cold sheets. Where’d he go? He had felt so close. I opened my eyes seeing only early morning sunlight spilling into the room. Had it just been a dream? Adrian. I hadn’t seen him in years. I first laid eyes on him at a beach bonfire party in California. Although we’d never met, I’d felt a jolt of recognition course through my body. From that moment, we rarely spent time apart and the closeness I felt to him only intensified. Three years after meeting, we stood in the Justice of the Peace’s office. Despite loving Adrian more than anything, the terrifying glimpses I’d witnessed of his anger scampered across my mind provoking me, at the last minute, to call off the wedding . . . breaking both of our hearts. Not even the man I eventually married had Adrian’s ability to know what I was thinking without ever saying a word. On Adrian’s thirtieth birthday, my daughter came into the world. Her birth reinforced my connection to him. I knew thoughts of Adrian would drift into my mind with each annual celebration. If you haven’t read my first two award-winning books, Linked Lives and Darkest Dawn…they are available on Amazon. Linked Lives Busts Into Top 400! It seems that being selected as one of the “Top 50 Writers You Should Be Reading” by the Author’s Show is making a difference. I am currently busy at work on a book proposal and needed some information, so went to Amazon to check on some things. Low and behold that’s when I discovered my book, Linked Lives, busted through into the top 400 books of women authors of literature! As of this morning, it’s #391. I am so jazzed!!!! If you haven’t read it yet, Linked Lives is a memoir written in honor of my best friend, about our friendship, encouragement, inspiration and unconditional love experienced over a lifetime. For anyone who has ever had a best friend, especially of the Baby Boomer generation, they’ll find themselves easily relating to this poignant story. Since it’s release, Linked Lives has received numerous 5-star reviews, and several book awards, including the 2014 Beverly Hill International Book Award. Get your copy now at Amazon. Linked Lives is a two-time international book award winner. Bonny Brookes, author of Linked Lives has been named as one of the “50 Great Writers You Should Be Reading.” Her honor came as the result of her recent appearance on The Authors Show. Brookes was chosen from a field of hundreds of authors who appeared on The Authors Show. Her book, entitled Linked Lives is a multiple-award winning heartfelt memoir of a dedicated true friendship that surpasses all surmountable obstacles and challenges of life. Readers around the globe are giving it 5 stars. [Valley Center CA, December 15, 2016] Bonny Brookes, author of Linked Lives has been named one of the “50 Great Writers You Should Be Reading”. This honor came as a result her appearance on The Authors Show. Brookes was chosen from a field of hundreds of authors through a public voting process. Linked Lives is a deeply-moving insight into a 40-year friendship that leaves the reader feeling better for having read it, along with the desire to keep their own friendships going strong. Upon the sudden death of Brookes’ best friend, Lori, the burning desire to keep Lori’s memory alive for her children and grandchildren, was the catalyst that brought Linked Lives to reality. Bonny Brookes wrote the first draft of the book in record time: just four short days. Readers are unanimously giving this book 5-stars on Amazon. It’s been said you’re stuck with family, but have the privilege of choosing your friends. And when friendships last for decades, “till death do us part,” they are more precious than gold. Such is the story Brookes shares in LINKED LIVES, her tribute to her best friend of 40 years, Lori. I fell in love with both these gals. I shared their laughter, their tears, their ups and downs as they traveled through this journey called life. While Lori’s life ended way too early, their shared memories are what Bonny wanted to relay to Lori’s family after her passing. She’s done her friend proud. This is truly a wonderful book in every way and I tip my hat to Bonny for having the strength to tell such an intimate and personal story. Brookes spends her time writing, photographing animals and nature, playing guitar or piano, talking to animals and exploring the world. She has one grown daughter, 4 cats, and currently calls Southern California home. Linked Lives has earned the Beverly Hills International Book Award, Readers Favorite Book Award, Indie Excellent Book Award and received numerous 5 star reviews. The book is available for purchase at Amazon.com and her website: www.BonnyBrookes.com. Wow! My book is in the library!! Went to the local library yesterday morning to return some books and what a thrill it was to see this…my book on display on the NEW BOOKS table. And to find out from the librarian people were asking for it! Yeah! Made my day!! If you haven’t read it, or are looking for a great gift to show your best friend how special she is to you, gift a copy of Linked Lives! Thank you, thank you, thank you! I just got word I’ve advanced from “nominated” to “finalist” for the 50 Great Writers You Should Be Reading!! I am asking for your help, one more time because now begins a new round of voting (ends December 4th). Please, take a moment now to vote once again (my name is just a few from the bottom of the list) by clicking this link. Thanks for your support and encouragement! The deadline for voting for me (Bonny Brookes) as one of the Top 50 Writers you should be reading is this coming Thursday. If you’ve already voted…thanks so much..and you can vote again! If not, please take a minute now to go to http://www.questionpro.com/a/TakeSurvey?id=4767072, click on “next” then scroll down, and click next to Bonny Brookes (memoirs). If you haven’t read it, you can listen to a radio interview I did earlier this year, as well as reviews at www.bonnybrookes.com. I really appreciate your support. Thanks! I have been nominated as one of the 50 Great Writers You Should Be Reading. If you have read either of my books and happen to agree with that, please vote for me (my name is near the end of the list) by clicking here. If you haven’t read my books yet, they are available here. Thank for your time and effort! I have had the extreme honor of being interviewed for The Authors Show – an internet radio program. My 15-minute interview, promoting my award winning book, is being broadcast on MONDAY (January 25th) repeatedly throughout the day. I hope you are able to listen! Here is the link: www.theauthorsshow.com then click on the underlined book title link to LINKED LIVES to hear the interview. The interview plays on from Midnight to 11:00 PM Eastern Standard Time Zone for a period of 23 hours. November is National Adoption Month. There are scads of books and shows about children adopted, from the children’s views, from the adoptive parents’ view, but what goes on in the mind of the woman who is alone and scared and pregnant? The woman who faces one of the hardest decisions she’ll ever make, the woman who goes through the pain of childbirth and yet ends up alone? What makes her decide to give up her child for adoption? Darkest Dawn, based on true events, follows one birth mother’s story. Readers get into Linda’s head and into her heart as she navigates through one of the most painful decisions any woman could ever face, giving away her unborn child to strangers. 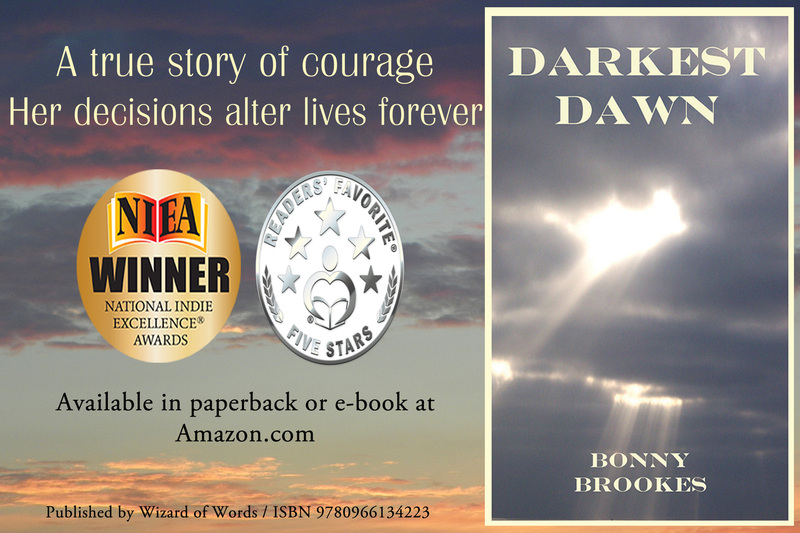 Awarded the 2014 National Indie Excellent Book Award, Darkest Dawn is available in print and Kindle formats at Amazon.com.